Prof. Raz Yirmiya, who heads Hebrew University’s psychoneuroimmunology laboratory, is the senior author of a new paper, “Depression as a microglial disease,” published in the October issue of Trends in Neurosciences. The paper urges a new focus in depression research away from neurons, the cells that make up the brain’s thinking faculties and allow it to control the body, and toward brain cells called microglia. About 10 percent of brain cells are microglia, which serve as a kind of infrastructure for the brain, holding neurons in place, passing oxygen and other nutrients to them and fighting brain infections. Microglia play a special role in repairing brain damage and trauma to neurons, the researchers note. “Our views on microglia have dramatically changed over the last decade,” Yirmiya said in a Thursday statement by Hebrew University. “Progress in the understanding of the biology of depression has been slow,” the researchers note in the paper. New research into the role of malfunctioning microglia could lead to a new push toward finding different and perhaps more effective treatment. Changes in microglia are found in patients with conditions that correlate with high instances of depression, including “infection, injury, trauma, aging, autoimmune diseases such as multiple sclerosis and neurodegenerative diseases such as Alzheimer’s disease,” the statement explains. Microglia in these conditions take on an “activated” state, growing larger and round while secreting chemicals that lead to inflammation in the brain. Microglia also change their shape and functioning when exposed to chronic unpredictable psychological stress, which is one of the leading causes of depression. Such conditions have also been found – in research carried out in Yirmiya’s Hebrew University laboratory – to correlate with microglia dying and remaining cells appearing shrunken and degenerated. Drugs that inhibit overactive microglia or stimulate suppressed microglia may be the key to dramatic new treatments, they argue. “Prof. Yirmiya’s new research could have a profound impact on the future development of anti-depressant medications. Present drugs do not always have the desired effect on patients, so there is an urgent need to discover novel biological mechanisms and drug targets for diagnosing the root cause of depression and for treating depressed patients appropriately,” the statement read. New drugs that restore function to diseased microglia, the researchers suggest, may turn out to be as effective as current fast-acting anti-depressants. Department of Neurology, University of Buffalo, Baird MS Center, Buffalo, NY. Depression is the second leading cause of disability worldwide, which struck 20% of women and 15% of men at least one episode in their lifetime. Depression is characterized by two or more weeks of depressed mood or diminished interest, associated with symptoms such as disturbed sleep, decrease in appetite and libido, psychomotor changes, reduced concentration, excessive guilt and suicidal thoughts or attempts. A variety of genetic, environmental and neurobiological factors are implicated in depression. The genetic contribution to the manifestation of depression has been estimated as 40-50%. However, combinations of multiple genetic factors may be involved in the development of disease, because a defect in a single gene usually fails to induce the expression of multifaceted symptoms of depression. In addition, non-genetic factors such cellular abnormalities and stress, interact with genetic factors, contributing to the prevalence of depression. Among cellular abnormalities contributing to depression is the dysfunction in the monoamine system. The deficiency or imbalances in the monoamine neurotransmitters, such as serotonin, dopamine and norepinephrine has been known to be the cause of depression. Typical antidepressants, such as 5-hydroxytryptamine (5-HT) selective reuptake inhibitors (SSRIs), exert clinical effects by blocking monoamine reuptake by the 5-HT transporter (Fig 1). However, these antidepressants are effective in less than 50% of patients and show a wide spectrum of undesired side effects. In addition, the chronic use of antidepressants is required to observe clinical benefits. Early studies demonstrated that stress decreases the level of BDNF in the hippocampus. These results, coupled with brain-imaging studies, which reported a decreased volume of limbic brain regions in depressive patients, have led to a neurotrophic hypothesis of depression. Studies show that BDNF has the potential to produce an antidepressant response in behavioral models of depression, and that genetic deletion or blockade of BDNF blocks the effects of antidepressant treatments. However, it is it noteworthy that BDNF has various function depending on the site it is expressed. 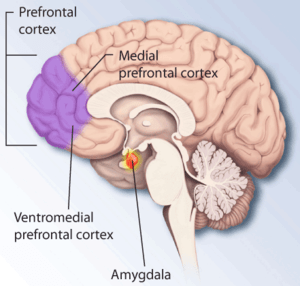 For example, BDNF in the mesolimbic dopamine system produces prodepressive effects and increases susceptibility to social defeat, effects that could oppose the antidepressant actions of BDNF in the Prefrontal cortex and hippocampus. Interestingly, BDNF administration by routes that would affect multiple brain regions (intracerebroventricular or systemic) produce antidepressant responses. Furthermore, the deletion or mutation of BDNF results in a state of increased susceptibility to other factors, such as stress. This type of gene-environment interaction is supported by studies demonstrating that BDNF heterozygous deletion mutant mice display depressive behavior only when exposed to mild stress that has no effect in wild-type mice. A chronic treatment with antidepressant is required to induce an increase in BDNF mRNA expression levels. However, it is a matter of debate to whether BDNF underlies the deleterious effects of stress and depression and, conversely, whether induction of BDNF mediates the beneficial effects of antidepressants. Nevertheless, a single nucleotide polymorphism (SNP) of BDNF, Val66Met, provides supporting evidence from human, as well as rodent studies, for a role of BDNF in depressive behavior. Typical antidepressants do not increase BDNF release, which could further contribute to the delayed response, as well as limited efficacy of these agents. Furthermore, in patients with severe depression, who are resistant to typical antidepressants, a novel class of antidepressants, the NMDA receptor antagonists, such as ketamine, are being evaluated. This class of antidepressants produces a rapid antidepressant action, an effect not seen with the typical antidepressants. 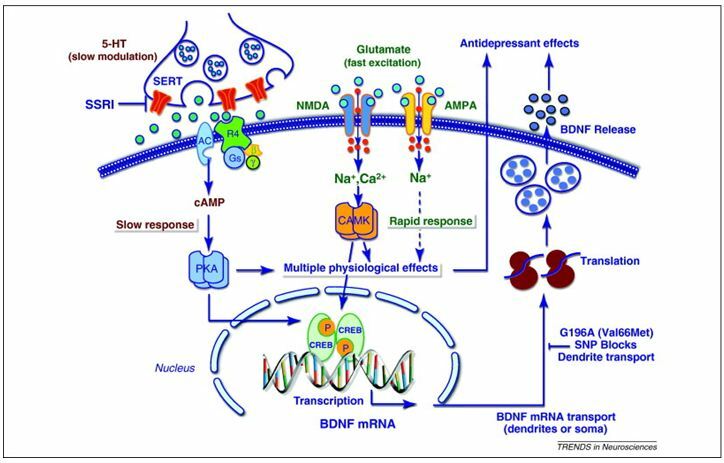 The mechanism of action of NMDA receptor antagonists involves increased glutamate transmission and induction of synaptogenesis, involving the upregulation of BDNF and other neurotrophic factors. The comparison of typical antidepressants with novel, rapid-acting NMDA antagonists also highlights the difference between agents that act on neuromodulatory systems (i.e.monoamines) compared with those that act on the major excitatory neurotransmitter system (i.e.glutamate). Figure 2. 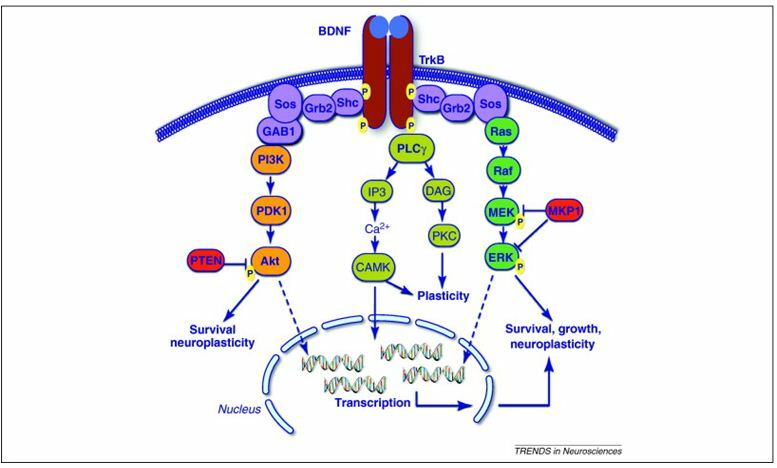 Brain-derived neurotrophic factor (BDNF)–tropomyosin-related kinase B (TrkB) signaling pathways. BDNF binding to the extracellular domain of TrkB induces dimerization and activation of the intracellular tyrosine kinase domain. This results in autophosphorylation of tyrosine residues that then serve as sites for interaction with adaptor proteins and activation of intracellular signaling cascades, including the Ras–microtubule-associated protein kinase (MAPK), phosphatidyl inositol-3 kinase (PI3K)/serine threonine kinase (Akt) and phospholipase C (PLC)-g pathways. Phosphorylation of tyrosine 515 of TrkB leads to recruitment of the Src homology 2 domaincontaining (Shc) adaptor protein, followed by recruitment of growth factor receptor-bound protein 2 (Grb2) and son of sevenless (SOS) and activation of the Ras–MAPK pathway (right). Shc–Grb2 can also lead to recruitment of Grb2-associated binder-1 (GAB1) and activation of the PI3K–Akt pathway (left). Phosphorylation of the TrkB tyrosine residue 816 results in recruitment of PLCg, which leads to the formation of inositol triphosphate (IP3) and regulation of intracellular Ca2+ and diacylglycerol (DAG), which activates CAMK and protein kinase C (PKC). These pathways control many different aspects of cellular function, including synaptic plasticity, survival and growth and/or differentiation. Basic and clinical studies demonstrate that BDNF and components of the Ras–MAPK and PI3K–Akt pathways are decreased by stress and depression, and increased by antidepressant treatments. Abbreviations: ERK, extracellular signal regulated kinase; MEK, MAP/ERK kinase; MKP1, MAP kinase phosphatase 1; PDK1, 3-phosphoinositide-dependent protein kinase 1; PTEN, phosphatase and tensin homolog. The lysosomal lipid metabolizing enzyme, acid sphingomyelinase (ASM), cleaves sphingomyelin into ceramide and phosphorylcholine. In a pilot study, the activity of this enzyme was increased in peripheral blood cells of patients with major depressive disorder, making the ASM an interesting molecular target of antidepressant drugs. It is postulated that the accumulation of the enzyme in the lyzozome may play a role in depressive disorders (pharmacokinetic hypothesis), and its inhibition by cationic amphiphilic substances, which traverse the BBB, and which cause the detachment of the enzyme from the inner lysosomal membranes, and its consecutive inactivation, could improve depressive disorders. In addition, ASM inhibitors could exert antidepressant effects by modulating monoamine receptor and transporter, since ASM inhibitors are known to inhibit interferon-alpha-induced 5-HT uptake. In addition, ceramide and its metabolite sphingosine-1-phosphate have been shown to also antagonistically regulate apoptosis, cellular differentiation, proliferation and cell migration. Therefore, inhibitors of ASM or ceramide hold promise for a number of new clinical therapies for Alzheimer’s disease and cancer. Another new promising method of treating depression, as well as other clinical pathologies such as obsessive-compulsive disorders, Tourette’s syndrome, substance abuse, dementia and anxiety is deep brain stimulation (DBS). These pathologies are classified as the dysfunctions of networks which process motivational and affective stimuli. DBS permits the selective and basically reversible modulation of such networks, with marginal or non adverse effects. In the field of treatment-resistant depressive disorders, uncontrolled studies have been published with initial satisfactory and concordant indications of the therapeutic effect of DBS in a variety of target areas of the brain. 2. Lee S. Jeong J. Kwak Y. Park SK. Depression research: where are we now?. [Review] Molecular Brain. 3:8, 2010. 4. Cryan JF. Slattery DA. GABAB receptors and depression. Current status. [Review] Advances in Pharmacology. 58:427-51, 2010. 5. Schlapfer TE. Kayser S. The development of deep brain stimulation as a putative treatment for resistant psychiatric disorders]. [Review] Nervenarzt. 81(6):696-701, 2010 Jun. 6. Su HC. Ma CT. Lin CF. Wu HT. Chuang YH. Chen LJ. Tsao CW. The acid sphingomyelinase inhibitors block interferon-alpha-induced serotonin uptake via a COX-2/Akt/ERK/STAT-dependent pathway in T cells. International Immunopharmacology. 11(11):1823-31, 2011 Nov.
7. Kornhuber J. Tripal P. Reichel M. Muhle C. Rhein C. Muehlbacher M. Groemer TW. Gulbins E Functional Inhibitors of Acid Sphingomyelinase (FIASMAs): a novel pharmacological group of drugs with broad clinical applications. [Review] Cellular Physiology & Biochemistry. 26(1):9-20, 2010. 8. Kornhuber J. Muehlbacher M. Trapp S. Pechmann S. Friedl A. Reichel M. Muhle C. Terfloth L. Groemer TW. Spitzer GM. Liedl KR. Gulbins E. Tripal P. Identification of novel functional inhibitors of acid sphingomyelinase. PLoS ONE [Electronic Resource]. 6(8):e23852, 2011. Dysthymia is a chronic form of depression that is characterized by the presence of a depressed mood for most of the day, for more days than not, over a period of at least two years. Dysthymia may be intermittent and interspersed with periods of feeling normal, but these periods of improvement last for no more than two months. It is far better to treat dysthymia than to think of it as a minor condition. Bypassing treatment places people at increased risk for subsequently developing major depression. In fact, about 10 percent of people with dysthymia also have recurrent episodes of major depression, a condition known as double depression. What causes of dysthymia? Some medical conditions, including neurological disorders (such as multiple sclerosis and stroke), hypothyroidism, fibromyalgia and chronic fatigue syndrome, are associated with dysthymia. Investigators believe that, in these cases, developing dysthymia is not a psychological reaction to being ill but rather is a biological effect of these disorders. There are many reasons for this connection. It may be that these medical conditions interfere with the action of neurotransmitters, or that medications (such as corticosteroids or beta-blockers) taken for a medical illness may trigger the dysthymia or that both dysthymia and the medical illness are related in some other way, reinforcing each other in a complicated manner. Dysthymia can also follow severe psychological stress, such as losing a spouse or caring for a chronically ill loved one. Older people who have never had psychiatric disorders are particularly susceptible to developing dysthymia after significant life stresses. Following the arrival in the 1990s of a drug for treating depression called fluoxetine (better known by its brand name, Prozac) – a “selective serotonin reuptake inhibitor” (SSRI) – it’s probably fair to say that not many drugs have become as deeply engrained in the public’s general awareness as those of this type. Perhaps one reason for this could be the sheer number of people affected by depression and to whom SSRIs are relevant as a possible treatment (one study has estimated that depression affected upwards of 30 million Europeans in the year 2010 ). Perhaps another reason could be the various controversies that have surrounded SSRIs over the years, from stories of increased suicide risk in children  to evidence of biases and the “selective” publishing of clinical data favoring the effectiveness of these drugs . Of course, despite the controversies, SSRIs (along with other classes of antidepressant drug) continue to be a mainstay, but let’s not forget, amid their popularity, that there are other ways to treat depressive illnesses. And in maximizing the benefits of treatment for the individual, it’s important to realize that any one of these approaches might work well for one person, but not for another. Among the non-pharmacologic ways to treat depression are psychological approaches, for example cognitive behavioral therapy, or alternatively, “brain stimulation” approaches such as electroconvulsive therapy (ECT). ECT is a method to induce a mild seizure in the patient by means of electrical activity applied to the brain via electrodes connected to the temples. On the subject of ECT; you could be forgiven for thinking that it’s not very nice, especially if you’ve seen the plights of characters like Randle Patrick “Mac” McMurphy, portrayed by Jack Nicholson in One Flew Over the Cuckoo’s Nest or Russell Crowe’s portrayal of Dr. John Nash (based on the real-life Nobel Laureate in Economics by the same name) in A Beautiful Mind. Nonetheless, despite the treatment in Hollywood of ECT as a sinister, repressive, and even brutal procedure, the reality is obviously different and it continues to have a place in medical practice for the treatment of severely depressed patients to this day. This isn’t to say that controversies don’t exist within the medical community concerning certain side effects (such as memory loss), but in balancing this, we should remember that many – if not most – medical procedures have their drawbacks (hopefully, the benefits will far outweigh the drawbacks). Putting aside any thoughts on whether ECT is good or bad, it is recognition and consideration of the drawbacks that helps drive the evolution of medical technologies. So, in illustrating the evolution that is happening in the field of brain stimulation for treating neurological disorders (in this case, depression and also epilepsy), the recent approval in Europe of an “external Trigeminal Nerve Stimulation” (eTNS) technique provides an excellent example. 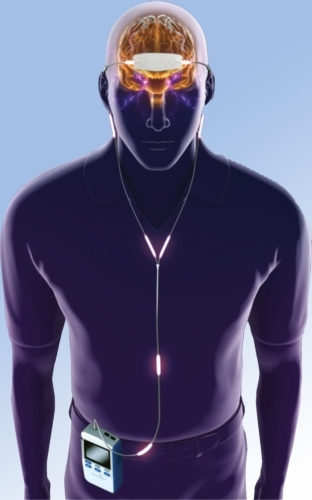 The technique, called the MonarchTM and exclusively licensed to Neurosigma Inc. (a Los Angeles-based medical device company) “for the adjunctive treatment of epilepsy and major depressive disorder, for adults and children 9 years and older”, is a non-invasive form of neuromodulation therapy . It was invented at the University of California, Los Angleles (UCLA) and has been in development for over 10 years . It works by using a low-energy stimulus to stimulate branches of the trigeminal nerve, a nerve that can affect the activity of several key brain regions believed to be involved in depression and epilepsy. In contrast to ECT, the stimulus is restricted to the soft tissues of the forehead without direct penetration to the brain, which thereby facilitates a non-invasive form of neuromodulation . Following European approval, Neurosigma affirmed in a press release that eTNS is “supported by years of safety and compelling efficacy data generated in clinical trials conducted at UCLA and the University of Southern California (USC)” . In realizing the future potential of eTNS, Neurosigma’s business strategy is now geared toward steps for its adoption at major epilepsy and depression centers in the EU, as well as endeavors to make it available to patients in the US and other countries . To answer the question of whether eTNS will rise to prominence as an effective treatment in the fight against depression and epilepsy, only time will tell. But if it does, as well as being a valuable addition to the armamentarium against these debilitating diseases, maybe its non-invasive nature will mean that the film directors have a harder time in “demonizing” it for dramatic effect. Well anyway, let’s hope so. Wittchen et al. Eur Neuropsychopharmacol 2011: 21:655-79. Turner et al. N Engl J Med 2008; 358:252-60. The hypothalamic-pituitary-adrenal (HPA) axis – which can be thought of as a series of closely linked endocrine structures in the brain – has a key role in triggering the body’s stress response through the secretion of cortisol. In explaining how the HPA axis is itself regulated, for example how its activity is increased in response to a perceived environmental threat, we can infer that the diverse brain areas with which it shares neural interconnections have a crucial role (for a review, see ). An equally important question relates to how the activity of the HPA axis is returned to normal when the stress response is no longer needed. To answer this, it is well known that the same “neurosteroid” hormones released by the HPA axis that trigger stress-related biological adaptations also serve to dampen its activity through a “negative feedback” mechanism. In re-defining the biological model of how neurosteroids control the HPA axis, a study led by Jamie Maguire, PhD at Tufts University (Boston, MA) provides some fascinating insights . Moreover, this study has some extremely interesting and counter-intuitive implications for understanding the functions of the “inhibitory” brain chemical gamma-aminobutyric acid (GABA), which is best known for opposing the effects of “excitatory” brain chemicals in order to balance the flow of electrical activity in the brain. To study how the HPA axis is regulated by neurosteroids, Maguire’s team performed investigations in mice using the neurosteroid tetrahydrodeoxycorticosterone (THDOC). The investigators found that THDOC, when applied to a discrete population of cells in the thalamus called the paraventricular nucleus (PVN), resulted in a decrease in blood levels of corticosterone (the mouse equivalent of the human stress hormone, cortisol). This finding highlights the importance of the PVN as a key anatomical locus in the brain where neurosteroids act, and is consistent with the traditional view of neurosteroids as “negative regulators” of the HPA axis. However, in mice that underwent a stressful “restraint” procedure, it was found that a prior treatment with THDOC (thirty minutes before the stressful experience) resulted in augmentation of corticosterone levels (i.e. relative to mice that underwent the stressful experience but did not receive prior THDOC treatment). In parallel, it was shown that while application of THDOC normally decreased the electrical activity of PVN cells, it actually led to increases in mice that had undergone restraint. Taken together, these findings provide evidence that neurosteroids can have opposite effects on the HPA axis depending on the “stressed” state of the organism. Thinking about how a neurosteroid hormone can exert opposite effects on PVN cells in the thalamus may be confusing, but what may be more confusing is that these different actions depend on the same “inhibitory” brain chemical, GABA (a neurotransmitter), as well as the same molecular “machinery” (or receptors) with which GABA interacts. This was demonstrated by using mice in which a particular sub-component (or subunit) of the GABA receptor, the gamma subunit, had been genetically deleted; neurosteroids had absolutely no effect on the activity of the HPA axis (neither positive nor negative) in these gamma subunit-deficient mice. How is it possible to explain the seemingly paradoxical finding that neurosteroids can exert opposite effects on the HPA axis through the same neurotransmitter system? In addressing this question, it is important to remember that although neurotransmitters may be thought of as excitatory or inhibitory, their ability to trigger these effects depends solely on the molecular and cellular apparatus with which they interact. Normally, the inhibitory actions of GABA upon the electrical activity of nerve cells depend on the maintenance of an “electrochemical” gradient by a “transporter” molecule called KCC2 (which transports chloride ions out of cells). Maguire’s team showed that “dephosphorylation” (i.e. the removal of a small chemical moiety – the phosphate group – which is covalently bound at a specific site on the molecule) of KCC2 resulted in lower detectable levels of this transporter in the PVN. Similarly to innumerable other examples in biology where dephosphorylation (or the reverse, phosphorylation) serves as an exquisite regulatory mechanism for controlling the activity of molecular networks, removal of the phosphate group from KCC2 acts as a molecular “switch” that causes the breakdown of the electrochemical gradient. The outcome is that GABA has an excitatory influence on neural activity instead of the inhibitory influence with which it is usually associated. In common with many important contributions to scientific understanding, these findings should serve as a reminder that it is often necessary to challenge and question what is already “accepted” in our theoretical models, in the light of unexpected and sometimes counter-intuitive experimental results. Whatever the line of scientific inquiry may be, the reward for doing so will be a deeper and more comprehensive understanding of the natural phenomena being studied. The findings of Maguire and colleagues, published in the Journal of Neuroscience, have possible therapeutic implications for disorders associated with disrupted function of the HPA axis, including epilepsy and depression. Major depression or chronic stress can cause the loss of brain volume, a condition that contributes to both emotional and cognitive impairment. Now a team of researchers led by Yale University scientists has discovered one reason why this occurs—a single genetic switch that triggers loss of brain connections in humans and depression in animal models. The findings, reported in Nature Medicine, show that the genetic switch known as a transcription factor represses the expression of several genes that are necessary for the formation of synaptic connections between brain cells, which in turn could contribute to loss of brain mass in the prefrontal cortex. The research team analyzed tissue of depressed and non-depressed patients donated from a brain bank and looked for different patterns of gene activation. The brains of patients who had been depressed exhibited lower levels of expression in genes that are required for the function and structure of brain synapses. Lead author and postdoctoral researcher H.J. Kang discovered that at least five of these genes could be regulated by a single transcription factor called GATA1. When the transcription factor was activated, rodents exhibited depressive-like symptoms, suggesting GATA1 plays a role not only in the loss of connections between neurons but also in symptoms of depression. Duman theorizes that genetic variations in GATA1 may one day help identify people at high risk for major depression or sensitivity to stress.